This transparent reality simulation shows the mass transfer zone (MTZ) and how its size and motion through the absorber is affected by the user-adjustable fresh gas flow (FGF), minute ventilation, inspiratory flowrate (a function of inspiratory time and tidal volume). 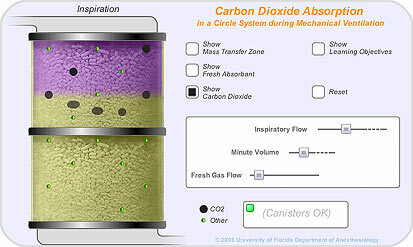 The flow of gas through the CO2 absorbent is bi-directional. It is proportional to FGF when flowing up during expiration and inspiratory flow when flowing down during inspiration. The CO2 absorbent theoretically lasts forever if FGF is greater than minute volume (MV). The amount of CO2 presented to the absorbent is scaled to the difference between MV and FGF. If FGF > MV, CO2 is flushed away by FGF during expiration and does not reach the absorber, and the mass transfer zone no longer moves through the absorber. The MTZ is the zone where CO2 is actively absorbed and is a function of the residence time, the contact time required for absorption of CO2 molecules by active (non-exhausted) absorbent. The height of the MTZ is scaled to inspiratory flowrate. A faster inspiratory flow requires a larger MTZ to ensure adequate residence time. The rate of movement of the MTZ through the absorber, and hence the remaining capacity, depends on the concentration of CO2 entering the absorber. A low FGF relative to MV will result in more CO2 being absorbed and a faster rate of movement of the MTZ, i.e., faster exhaustion of the CO2 absorbent.